1) HopDog is one of the two breweries on the South Coast where I live. So I gloat a little when I see people in Melbourne acting like it’s a special treat to get some HopDog beers, because I could try them any time. Well, if I wasn’t so frigging lazy. See the brewery is more than an hour south of where I live and that’s ‘‘day trip’’ territory, not ‘‘I’m just ducking down to the brewery’’ territory. An hour each way is a long way to try some of their beers. So, if you think about it, those people in Melbourne probably get to try Hopdog more than me. Dammit. 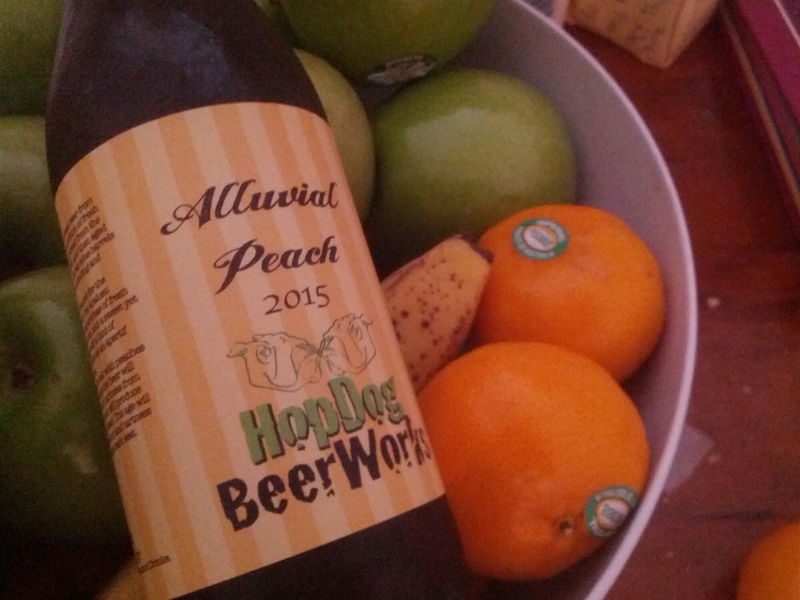 2) Alluvial Peach is the only real beer I’ve ever helped to brew. I mean ‘‘real’’ in the sense that it was done in a commercial brewery and not a homebrew set-up. In January last year I went down to HopDog in Nowra to write a first-person account of being a brewer for a day. Yep, sometimes I get to do fun things and call it ‘‘work’’. 3) For a long while I never really liked this beer very much. I think it was because my palate wasn’t quite up to it. So for a year or two I avoided buying it when I saw it in the bottle shop – even though I felt like I should be supporting one of my local breweries. So I’m not sure why I picked up a bottle of the 2015 version – guilt maybe. But I’m glad I did. It’s a really nicely balanced mix of sweet and tart. Those flavours complement each other rather than fighting for your attention. 4) It’s a beer that has a foot in the ‘‘sour’’ camp, which would have been a large part of why I didn’t like it in the beginning. Of all the beer styles I’ve had to get used to, sours was the one that took the most work and really did my head in. It just took so long to understand that it was still beer, because, if we’re being honest, sours don’t really taste like ‘‘beer:. 5) I’ve always been a but suspicious of sour beer. To me, the main distinction between a bad beer and a sour beer is intent. If you meant for it to taste that way, then it’s a sour beer. If you didn’t, then it’s a bad beer. So there’s always part of me that wonders how many sour beers weren’t actually supposed to turn out that way.